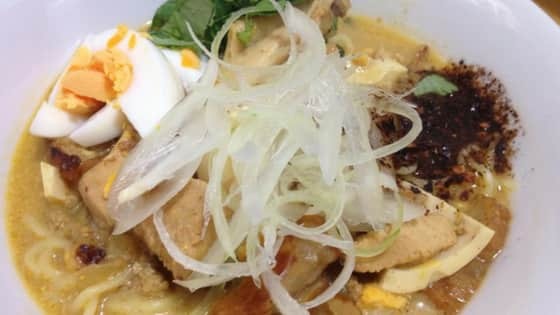 Once you have tasted any version of Burmese Khow Suey, you would want to eat it again. If you are a fan of soup, there are plenty of know suey soups with different ingredients and flavor. You just need to know how to eat Khow Suey in smarter way. If salad is your thing, you will have a hard time to choose one of the Khow Suey salad. 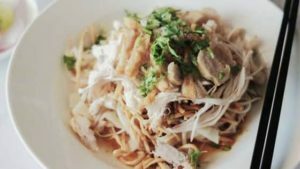 There are three most popular Khow Suey in Myanmar and they are Mohinga, Mont-di, and Ohn Noh Khow Suey (Burmese Chicken coconut Khow Suey). They are most often eaten for breakfast or as light meals and snack. All three different Khow Sueys are unique in their own way and the style of serving is different as well. Mohinga is served in thick fish broth (sometime light) and with thin rice noodles. Some people prefer to eat Mohinga with flat rice noodles. Mohinga is an unofficial national dish and different regions have different style of cooking Mohinga. The broth has rich fish taste and yellow bean help it tastes heavier and smoother. Eating Mohinga is not a rocket science and you just need to pour the fish broth over the thin-rice-noodle. If you wish to make the Mohinga taste better, you can add some more fish-sauce which is quite salty. If you are a fan of spicy-food, you may add some chili-pounders and it will make the dish more colorful. 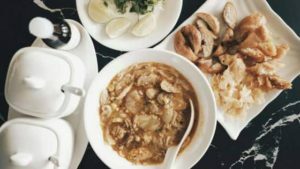 You can also top the Khow Suey soup with some crispy deep-fried veggies or lentils. Coriander leaves is the favorite spice that Burmese people would love to add in Mohinga. After adding all those toppings, you will get a perfect tasty Mohinga Khow Suey to enjoy. 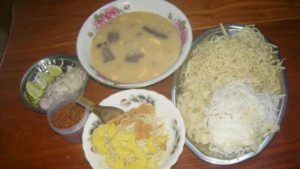 Mont Di Khow Suey is a type of Khow Suey salad and it is one of the most famous breakfast in Myanmar. It is also known as Nan Gyi Thoke in some of the places. Spaghetti-like rice noodles is used and served with chunks of chicken curry. You can choose the size of the rice noodles for the Mont Di Khow Suey salad. You can add more fried onions, fish sauce, coriander leaves, and featherback fish cutlets. As a condiment, you can add round rings of onions and lime juice in this khow suey salad. If one likes Mont Di khow suey spicy, some chili pounder will make it taste perfect. Ohn noh Khow Suey also known as chicken spiced coconut Khow Suey is a special food of Myanmar. Wheat noodles or egg noodles can be used to serve Ohn Noh Khow Suey and the main ingredient is coconut milk. The chicken broth is made with coconut milk and the thick broth has sweet and special taste. The smell of this khow suey is so sweet and it can make anyone’s mouth to water. Since this Khow Suey is quite sweet, you can add some lime-juice in it to make it less rich with sweetness. By adding rings of onions can help it taste stronger and a bit spicy. You can garnish Burmese Chicken coconut Khow Suey with pieces of hard-boiled egg, fish sauce, and coriander leaves. Crispy deep-fried veggies or lentils will make your Khow Suey soup more crunchy and more enjoyable.